The Samsung’s Galaxy S IV event will be taking place in Radio City Music Hall in a few hours. While the company has been using the “4” numeral a lot in its hype campaign for the next Galaxy smartphone, its rival was trying to imitate it as well. 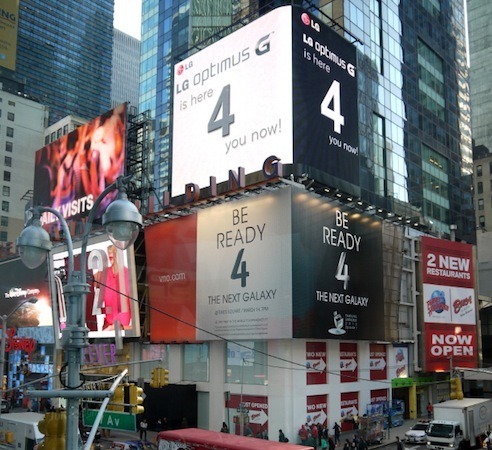 Samsung has occupied Wall Street with its huge billboards on Times Square calling New Yorkers to “Be ready 4 the next Galaxy.” However, LG has refashioned its billboards right above its competitor’s billboards to mock Samsung’s “4” themed advertising, touting that its latest Optimus G flagship smartphone is “here 4 you now”. Though LG’s own advertisements are undoubtedly higher and brighter than Samsung’s, could it possible beat what its larger rival has in store? We will know soon after the Samsung’s unpacked event.